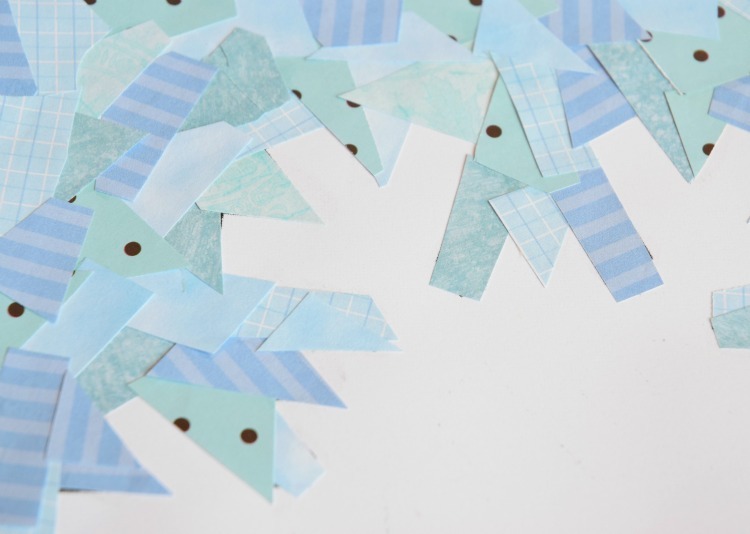 On a recent snowy day, the girls wanted to make paper snowflakes. 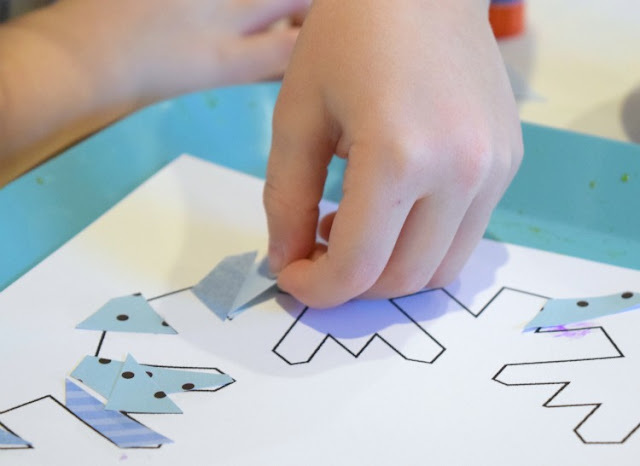 First we did the traditional kind, where you fold the paper and cut out the shapes and designs. Then I decided to have a little art lesson on negative space. I explained how negative space is the space around or between objects in a painting or image. We used our trusty Art Book For Children to find a few examples. In this case we decorated the space around a snowflake shape, rather than a snowflake itself in order to demonstrate the idea. 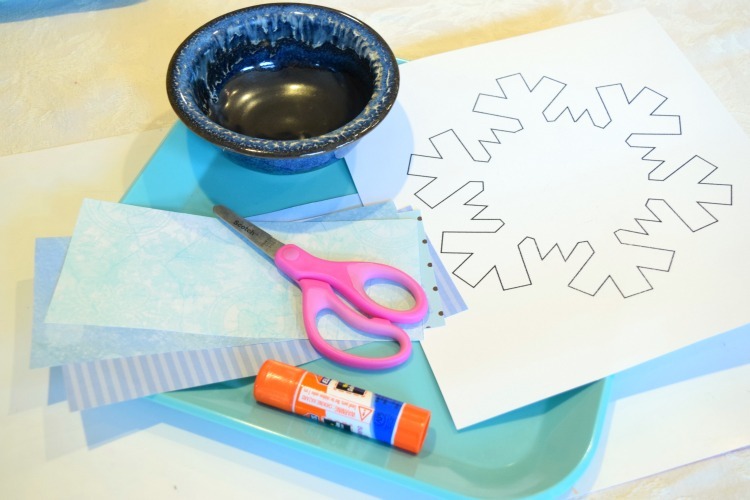 While this snowflake craft isn't exactly an example of negative space, I figured it was close enough to illustrate the concept for young children. 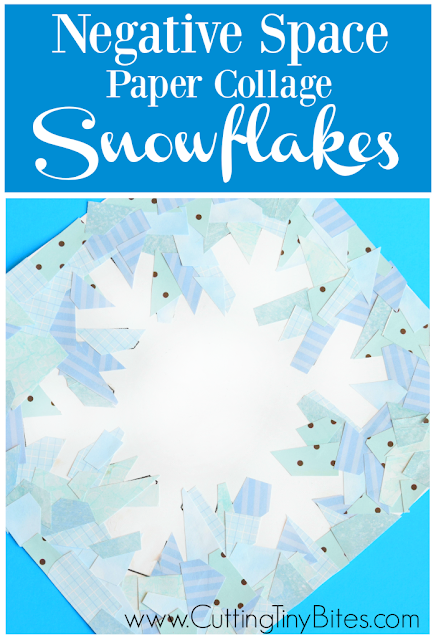 Print your snowflake on white cardstock. You'll do best with a snowflake that isn't too complicated, without too many fine details. We ended up with this one. Begin by snipping small scraps of blue paper. Try to get them in different sizes and shapes. Next, start gluing the scraps of paper around the outside edge of the snowflake. Try to find pieces to fit in all the little angles. 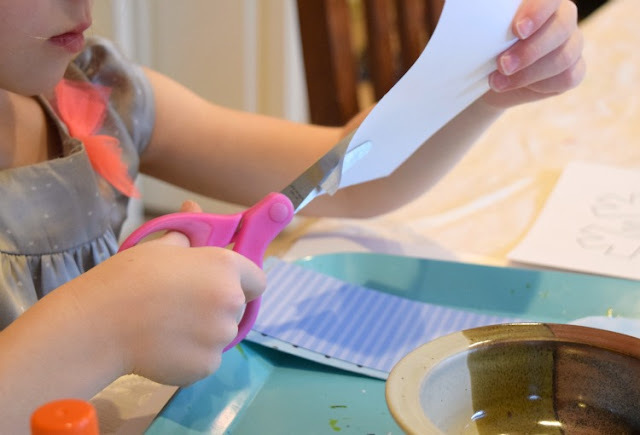 3-year-old Maggie didn't quite get it but she always like snipping and gluing, so she enjoyed herself anyway. 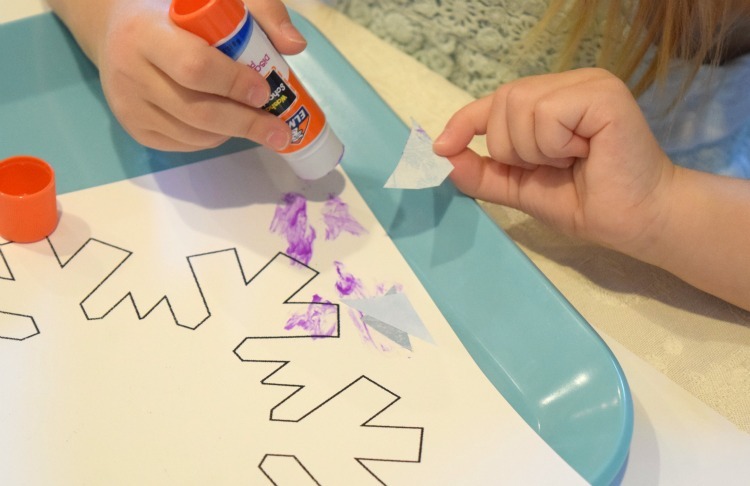 Continue gluing until you've made your way all around the snowflake. Fill in all the white space around the edge of the paper. This project ended up being pretty challenging for my 5.5-year-old. She did enjoy it, and completed most of the snowflake by herself, but it took some time. 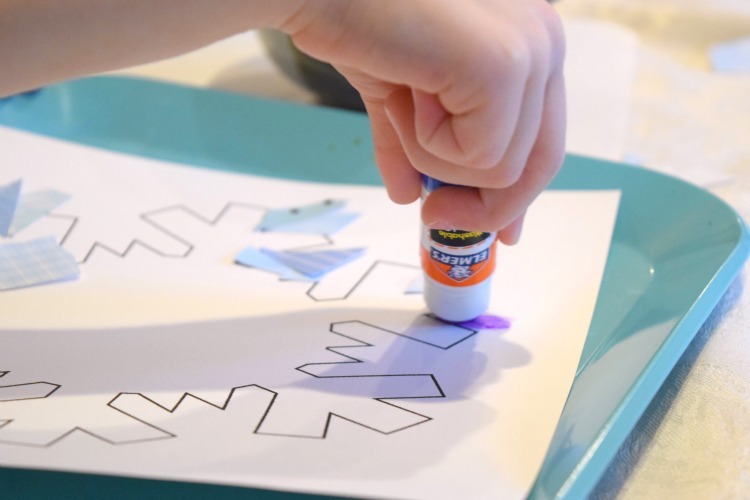 I would recommend this project for middle elementary age or older (or extremely craft-minded younger children). I especially like how you have to sort of stand back from the paper in order to get a good look at the shape. If you look at it too close up, it's hard to tell what it is! 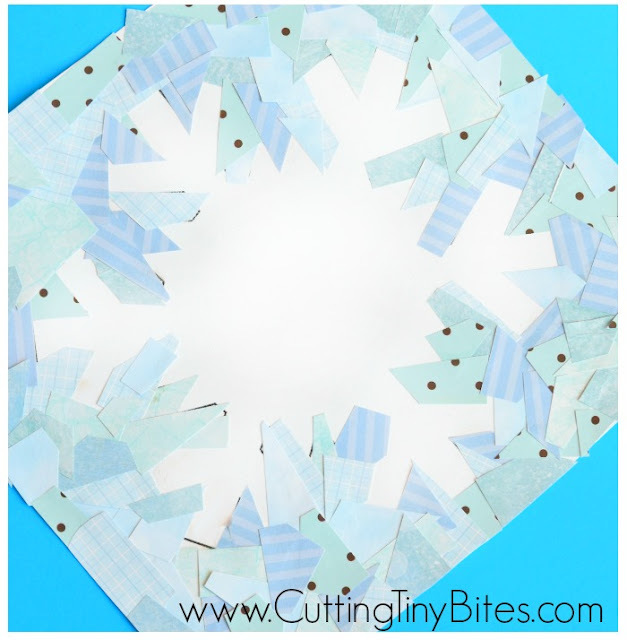 Winter snowflake craft to demonstrate the idea of negative space. Made with paper collage, this activity is great for fine motor development and spatial skills in elementary aged children.